Steer your way to cleaner floors. Think of the BD 38/12 as a 15 inch disc version of the popular BR 35/12. The design allows for the easiest driving of a walk-behind disk scrubber on the market. The squeegee follows behind the disc to ensure 100% solution pickup even through the corners. 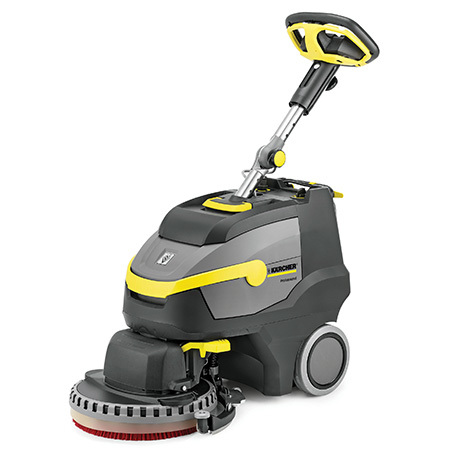 Extremely agile for efficient cleaning of small and very furnished areas. Easy to use—scrub right up to the wall. Quick charging lithium-ion battery has a longer lifetime than normal batteries. Very compact, light and easy to transport and roll over steps. Application also in noise sensitive areas possible due to signicantly reduced noise level.